Sunshine and great skiing conditions: what else can one ask for a Worldloppet race especially after so many race cancellations in the 2014 European Winter. 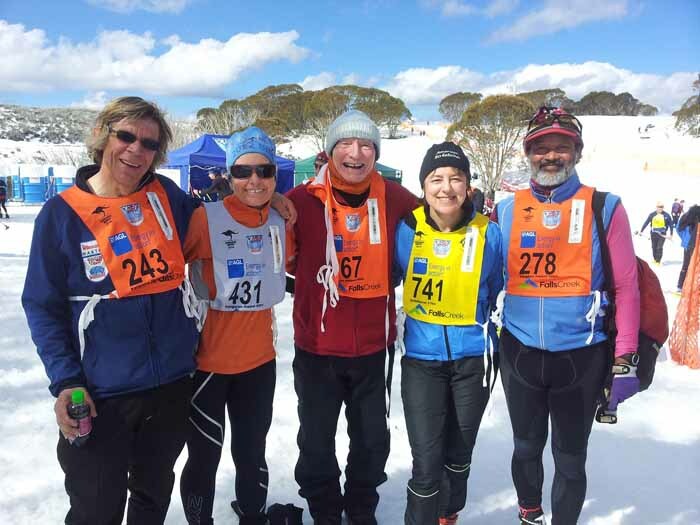 The2014 Kangaroo Hoppet held on 23rd August was an absolute delight; great weather, great snow, lots of keen skiers and lots of encouraging spectators. The days leading up to the Hoppet were very warm with some inte rnationals feeling very hot skiing whilst only wearing a minimum of clothes. Race day was brilliant with just enough cloud so the temperature wasn’t too hot but firm conditions (after an overnight freeze) softened by the descent off Heathy Spur and for the second loop. A well attended Worldloppet Masters’ reception was held at nearby Howmans Gap Alpine Centre with great finger food and drinks all around. The CEO of Falls Creek Alpine Resort greeted us all to Australia’s penultimate cross country ski event. There were some 1100 participants in the 3 events- Kangaroo Hoppet (shortened to 36km due to snow melt on part of the course), Birkebeiner (21km) and the Joey Hoppet (7km). There’s an event to suit everyone with a special pouch class in the Joey for parents pulling a pulk with a young child. A new improved staggered start system was implemented this year with waves of 100 starting one minute apart after the welcoming ceremony by the local indigenous representatives. . It seems such a short time between each wave but it greatly relieved congestion in the early part of the course especially on the first downhill. It was also easier for faster Birkebeiner skiers who started 7-10 minutes later to overtake slower Hoppet skiers and for quicker Joey skiers to overtake Birkebeiner skiers. 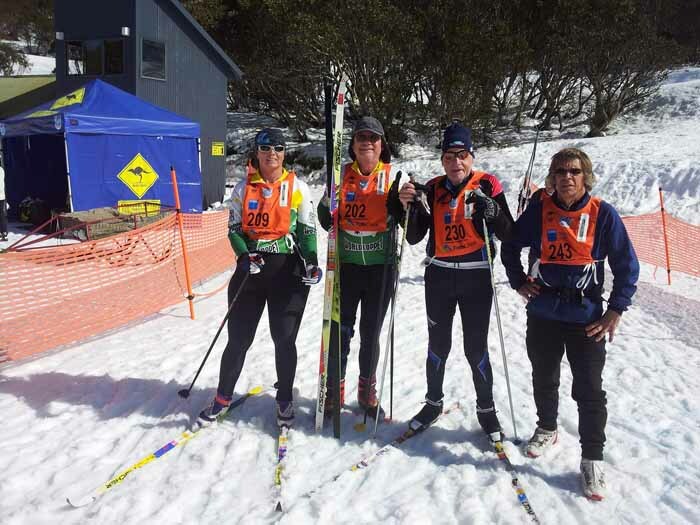 This year skiers who had completed 20 or more Kangaroo Hoppets (over 40 participants!) were awarded a special silver bib and started right behind the first 100 skiers. The first 10km of the course out to Sun Valley and across the Rocky Valley Dam wall to Watchbed Creek was relatively flat with only a few small hills. Then the 3km uphill appropriately called the Paralyser is encountered before reaching a large open area called The Park which is where the trail breaks out of the snowgums ( native Australian alpine trees). Another short climb to the top of Heathy Spur where you are rewarded with stunning mountain views in all directions as far as Mt Kosciuszko, Australia’s highest mountain. The course then continues along Heathy Spur mostly descending with one final climb before the exciting Bladerunner descent back down to Rocky Valley Dam and into the spectator filled Nordic Bowl to complete the first loop. The second loop began the same way but instead of climbing all the way up the Paralyser from Watchbed Creek the return is much gentler Pauls Track on the return to the Nordic Bowl and the finish. Afterwards, skiers stood around in the warm sunshine enjoying a BBQ lunch swapping race stories with skiers from some 26 nationalities whilst cheering in other skiers. A few of the Worldloppet masters who participated included: Hannes Larsson (FRA), Jan Hurley (IRE), Bruce Wharrie (AUS), Angelo Corradini (ITA), Colin Addison(AUS), Judith Barnes (AUS), Ken Farrow(AUS), Merv Trease (AUS), Jay Wiener (USA), Ronice Goebel (AUS), Grant McLeod (CAN), Jim Spiers (AUS), Brian Wallace (AUS), Bob Cranage (AUS), Brendon Hyde (AUS), Daniel Cech (CZE), Vratislav Cech (CZE), Miroslav Dasek (CZE), Andre Viry (FRA), Robert Demmel (GER), Angelika Dietrich (GER). Sorry if I’ve missed you. 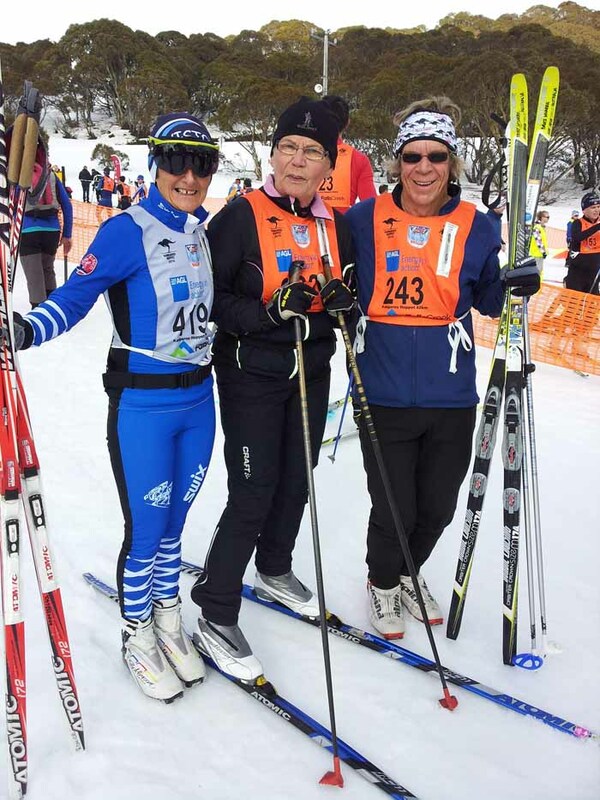 Social activities are high on the agenda at the Kangaroo Hoppet with Friday night’s Worldloppet reception a great opportunity for Worldloppet passport holders to catch up with friends from many different nations. On Saturday evening there was a race presentation where all participants, family and friends gathered to celebrate the winners, as well as age-group champions in all events. Angelo Corradini presented Worldloppet medals to Craig Alexander, Bruce Wharrie (4th gold) and myself (5th gold). 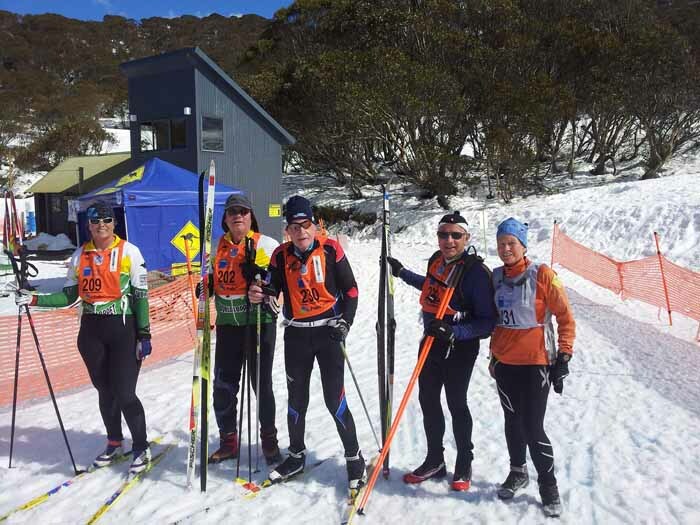 With New Zealand’s Merino Muster Worldloppet race being held the weekend before the Kangaroo Hoppet it’s a great opportunity for northern hemisphere skiers to escape the Summer heat and have a Winter down under. 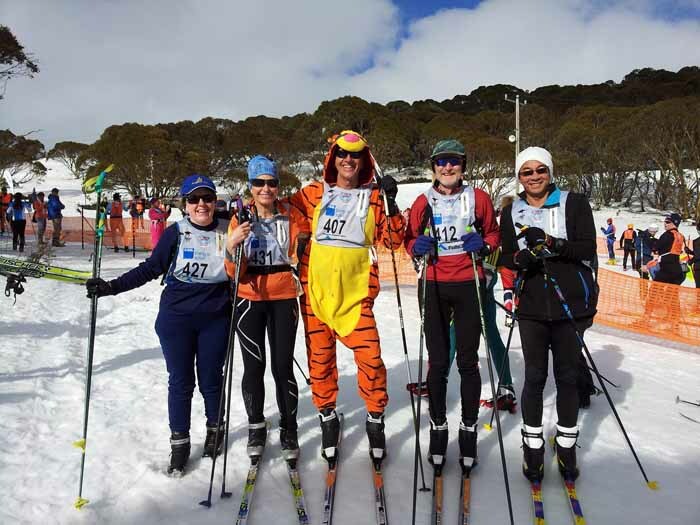 Ski the Merino Muster, then the Hoppet earning 2 Worldloppet stamps, then head to North QLD for snorkelling and diving at the Great Barrier Reef. A perfect Winter holiday! Hope to see you at the Hoppet soon.